Country club casual dress is a type of clothing style worn inside and outside a country club. Though the clothing that falls into this category has changed in recent years, there are a few things that remain constant and classy. It requires picking the right clothing and taking a "less is more" sensibility in regards to getting dressed. Country club casual once referred to clothing worn during the day and only on the grounds of the country club. As people began wearing their clothing into other areas, the trend expanded. People who previously couldn't afford to step foot in a country club can now wear the same clothing around town. The clothing itself also changed, as the older people stepped down from the country clubs and the younger generation took over. Men and women share a similarity when it comes to dressing country club casual, especially on the upper half of their body. It's recommended that men wear nicely pressed tailored shirts with crisp sleeves. They can also opt for polo shirts, if the shirts are new and clean. Women's shirts include nice sweaters made of cashmere or silk and those with tasteful buttons. Women can also pick shirts with feminine details such as pearl buttons or ruffles. Both sexes also have the option of tailored jackets. With country club casual dress, the bottom half of the outfit is less important than the top. Shorts and capri pants are typically not allowed, though women can wear knee-length skirts. Men are encouraged to wear pressed slacks in a black or khaki color. Corduroy is another option for both sexes, as are velvet pants or skirts for women. The pants or skirt should fit well and be slim fit, not boot cut or bell bottoms. 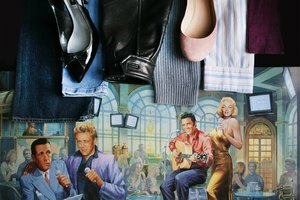 Most country clubs don't allow denim in their clubhouse or on the grounds. Accessories are a great way to finish off a country club casual outfit. With men, less is more. Jewelry should be kept to a minimum, with only a wedding ring or a tasteful watch prudent. Any other jewelry should be removed before entering the club. Belts are another option for men and woman. While men often opt for a belt that matches their shoes, women can pick an embellished or slightly trendy version. Gold and pearls, such as a pair of pearl earrings or a gold bracelet, are also good choices for women. Shoes are another part of the country club casual look. The top choices for women are ballet slippers or flats that resemble ballet slippers, especially those in black or pale pink. Another option is high heels, with a 3-inch heel. However, shoes with big heels or those with plastic or faux cork embellishments are discouraged. Men have the option of loafers, particularly black leather, and boots. Men who wear boots should look for those made of a quality leather in a dark brown or black shade.